The Little Giant stainless steel honey strainer uses a fine mesh to remove any leftover bits of wax and other particles before bottling. Designed to fit over a 5-gallon bucket. 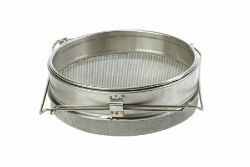 Place the strainer under the extractor before bottling.